Qiz Qalasi Tower is an eight-tiered monumental construction of the XII century, a unique architectural creation, which has no analogues in the world. Due to its uniqueness, architectural monument was included in the list of objects of UNESCO World Heritage. The tower stands on a ledge of the coastal rocks and represents a cylinder lined with gray limestone, 28 meters in height and 16.5 meters in diameter. The thickness of the walls at the base is 5 meters, and 4 meters at the top. From the eastern side of the tower there is a ledge, which appointment remains unknown to this day. More than 200 people could simultaneously hide inside the tower . 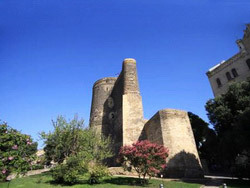 There are a lot of secrets and legends concerned exactly with this monument of Azerbaijani architecture. The name Qiz Qalasi, which is literally translated as Maiden`s Tower presumably, originates from the legend. One of which states that a Shah fell in love with his daughter and decided to marry her. Trying to save herself from that fate, and to dissuade her father, the girl asked shah to build a tower and wait until the construction is finished. When the construction was completed the king did not changed his mind and then a girl came up to the tower and threw herself from there into the sea. Afterwards the stone, up on which the princess was killed, became known as the Stone of Virgin, and by tradition brides, bring flowers to this place. There is another variant of this legend: after the girl threw herself into the sea, her beloved took revenge for his sweetheart and killed the king, but soon after that, he get to know that the girl was saved by mermaids. Later, beloveds were able to find each other and get married. Experts note that the desire of the father to take his daughter as his wife is the proof of that this legend has the pre-Islamic character. The legend also indicates that the Caspian Sea has stood at the foot of the Maiden`s Tower. According to another legend, St. Bartholomew, one of the twelve apostles of Jesus Christ was executed not far from the Maiden`s Tower. On the territory of Baku Bartholomew appeared in the I century, preaching Christianity among the pagan tribes. However, the doctrine of Bartholomew was rejected and he was executed at the walls of the Maiden`s Tower. During the excavations at the Maiden`s Tower there were found remains of an ancient temple, which is identified with the Basilica, erected on the place of apostle’s death.